What Contemplated Price For Junior’s Says About Real Estate Value of City-Owned Pacific Branch Library and Adjacent Medicaid Office Site: Couldn’t Be Crony Capitalism Again, Could It? 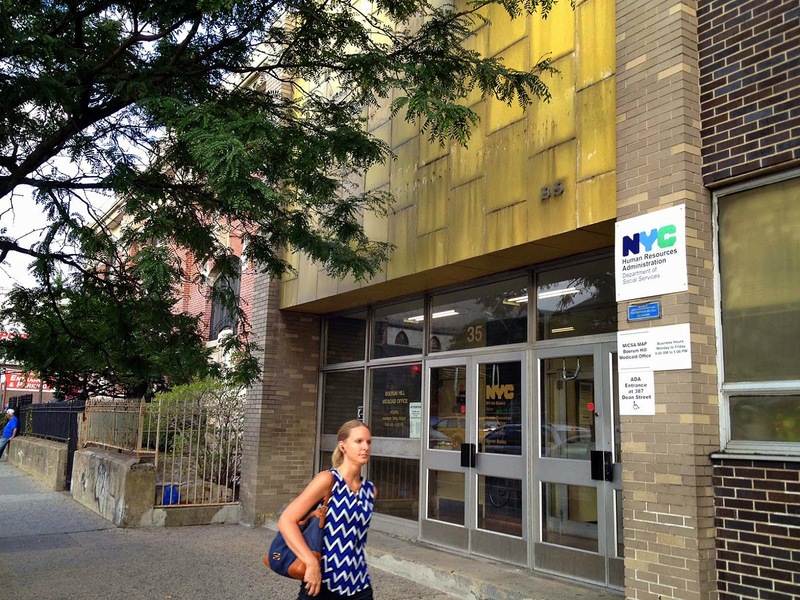 Just this last June it was announced that the city-owned Park Slope Boerum Hill Medicaid Office building on Fourth Avenue had been sold to a mysterious developer. It's the building next to the Pacific Branch library. 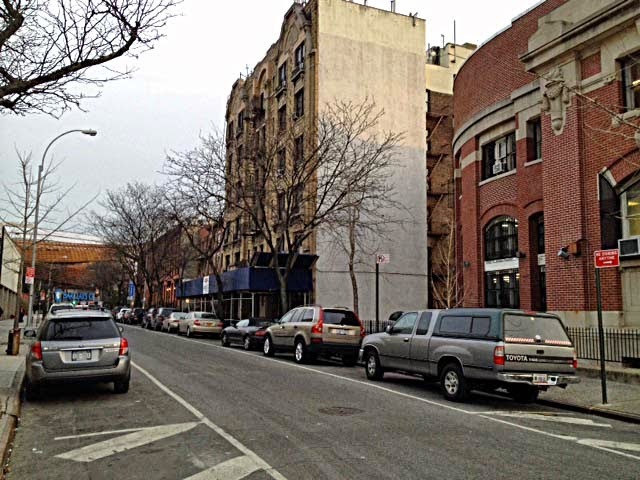 Air rights could easily be sold and utilized on that adjacent site without incurring the expense of tearing down (or replacing) the landmark building. But this doesn’t mean that the library would remain a library unless the community asserts itself. As it is, Citizens Defending Libraries is getting reports that this summer the BPL is shuttling down programs at Pacific Street and refusing to do proper maintenance. One has to wonder whether the $25 million that the Medicaid building sold for wasn’t rather low. In a few weeks we will probably see what the sale of Junior’s site, a few blocks away, brings in for comparison. (See: Report on Tuesday, June 3rd-9th City Council Hearing On Budget For NYC Libraries Plus Testimony of Citizens Defending Libraries.) 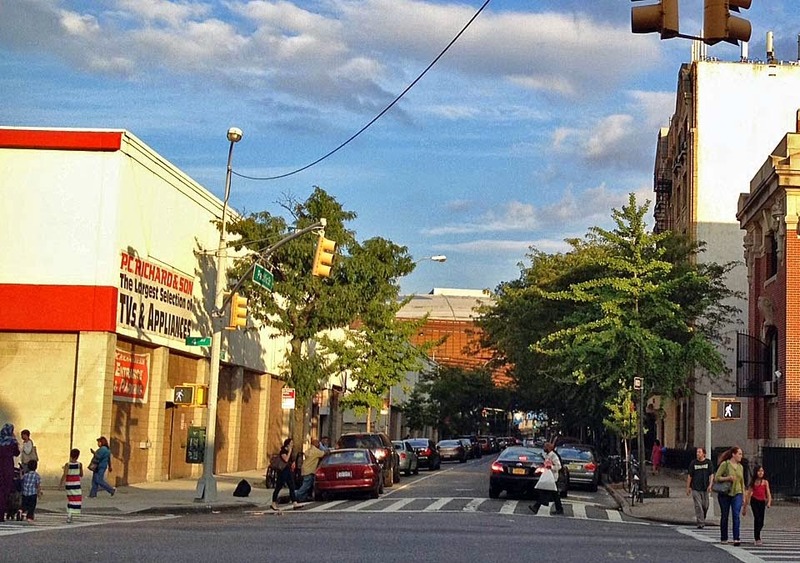 - Note the building is, indeed a de facto "landmark," but has never officially been been designated as such by the city despite community urging and a partially successful lawsuit to bring that about. 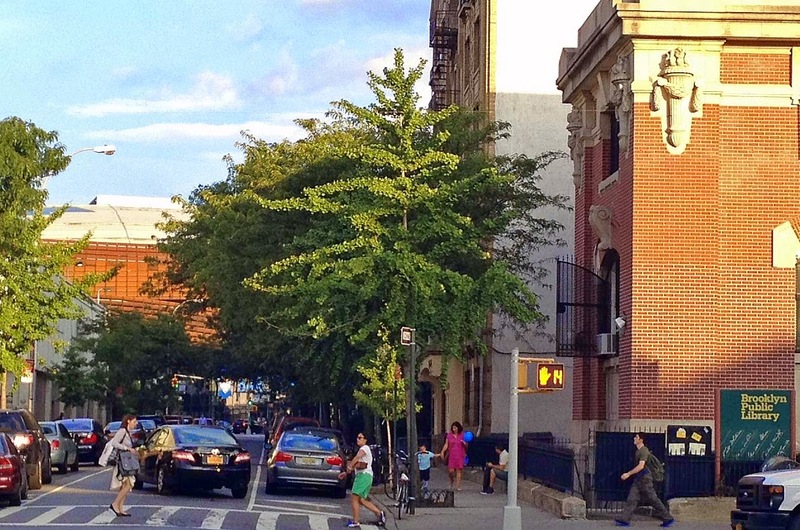 Offers to buy and build an apartment tower poured in from Brooklyn, Manhattan and abroad. The highest bid: $450 per buildable square foot, well over the previous high for Brooklyn of $350, for a total of $45 million in cash. When Mr. Rosen, 45, put the site up for sale in February, he said he would insist that the buyer bring Junior's back to the ground floor of any new building. . . The $45 million offer would not have accommodated a ground-floor Junior's. Robert Knakal, the broker on the not-quite-sale. . . . said he was consoling himself with the prospect of a couple of properties that would "probably" break the $500-per-square-foot barrier. So the figures from the story to work with are "$450 per buildable square foot" if the new owner can do whatever it wants with the site, half that, $225 per buildable square foot, if there were restrictions involving the owner taking back ground or lower floor space, or $500+ per buildable square foot if Mr. Knakal's boosterish ambitions could bear fruit. Given that the city is apparently selling the Medicaid building free and clear of any restrictions that would lower the price, the "$450 per buildable square foot" is the comparable that should therefore apply. If the mysterious developer believes that it has an inside track with the city to also buy the Pacific Branch or air rights from it, then there'd be reason to pay a premium for the Medicaid office building, raising the price even a bit higher. Did the mysterious 35 Holdings LLC, buying the Medicaid office property get any kind of a bargain? If Brownstowner is correct in reporting that the property has "up to 108,000 square feet in development rights" (being a "18,000-square-foot property") then the $25 million the buyer paid for the property means it paid about $231 per buildable square foot. Yikes! That only about half what the Junior's property was being valued at! Maybe the low price can be explained? Although prices are supposed to be shooting up in Brooklyn, maybe the Medicaid office location, just a few blocks and eleven minute walk away from Junior's (see above), is terrifically less desirable? To be more specific, the library and the Medicaid office are yards away from the Ratner/Prokhorov so-called "Barclays" arena. 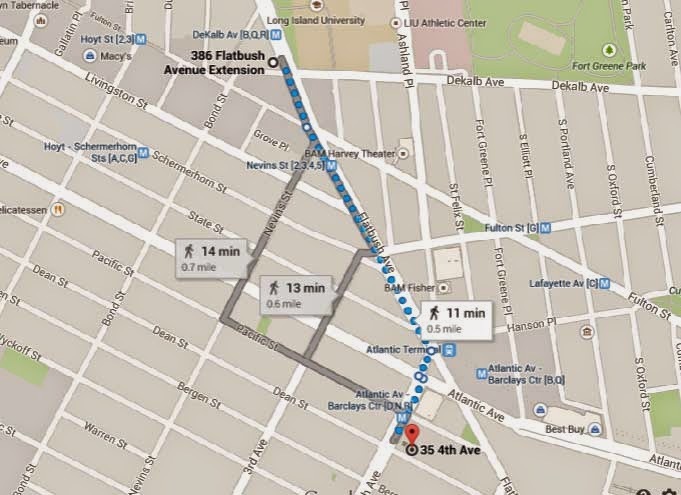 The library, itself, stands directly across the street from the Ratner Atlantic Yards footprint. Does this short shift in distance depress prices that much? Or, alternatively, could it theoretically depress prices to be so close to Ratner's mega-redevelopment? Wasn't the arena supposed to be giving a boost to the value of the properties next door? Maybe not. See: Wednesday, August 22, 2012, The arena effect or the "Brooklyn" effect? Top broker suggests the latter is more important. Still, on the other hand, while the existing Junior's location is already notably close to the Ratner arena, the Junior's owner when contemplating his sale options considered establishing another Junior's even closer to the arena. Atlantic Yards footprint (PC Richards on left) and arena: Is it desirable to be located near them? Why should an exceptionally low price for the city's sale of the Medicaid office attract our scrutiny? Because it could be a strong indicator of a crony-capitalistic deal where property is being handed off to someone with an inside connection, shortchanging the public of the value it deserves . . . just like the neighboring Atlantic Yards mega-monopoly itself, where public and eminent-domain-seized property property was handed off to Forest City Ratner without bid and at an apparent fraction of its true value. And if the city's Medicaid office sale reflects a crony-capitalistic shortchanging of the public, then there is every reason to believe that any sale of the Pacific Branch library or its real estate development rights by the city likely to fold into that transaction, would similarly reflect such a crony-capitalistic shortchanging of the public. What's more, when crony-capitalism drives deals there is never assurance that any of the underlying reasons for proceeding with such transactions make any sense at all, no assurance that such sales are undertaken intending to true public benefit in any way. With two photos side-by-side you can see, left to right, Ratner property in Atlantic Yards (now euphemistically "Pacific Park") footprint across from library, the arena, Pacific Branch and adjacent Medicaid office. Is the Times article declaring that the original Junior's will not be moving and will be preserved, its intact value recognized, just publicity for a playing-hard-to-get ploy? Would the Junior's owner really leave millions on the table and walk away? 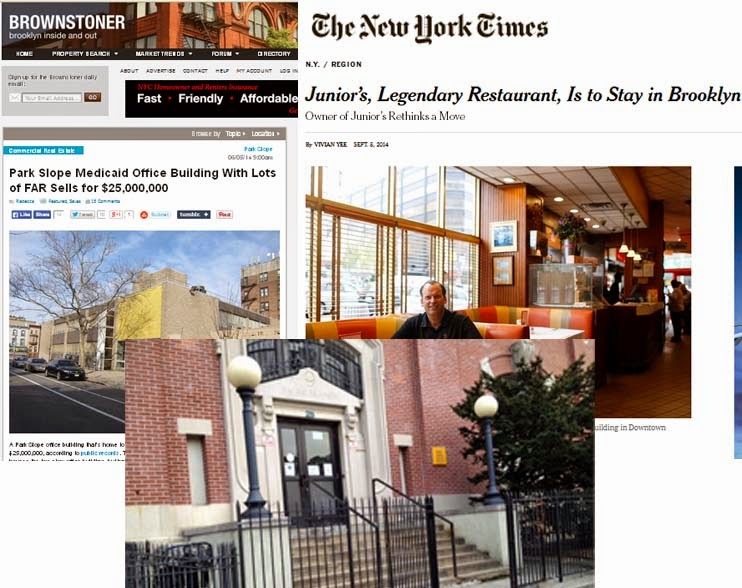 The Times article article doesn't carefully parse all the options, but maybe one is that Junior's, remaining at this location to which the owner explicitly wanted to bring it back in the end, would remain in place, its historic heritage undisturbed, while selling its air rights to neighboring property owners. The Times article doesn't say so, but that would be `a have your cheescake location and eat it too' option that could still scoop up most of the money now on the table. . . .
. . . .One thing is certain: Whatever deals are made, the property owner who might have sold Junior's is looking out for his own and his business's best interests. That protection of the seller's interest is not at all assured (quite the opposite) when it comes to those in hurrying to sell off our public assets. But do you remember that BEFORE Mayor Bloomberg was AGAINST sugary drinks he was FOR THEM and he was PUSHING THEM on New York City residents and school children. . . and in New York City libraries? Do I have your attention? 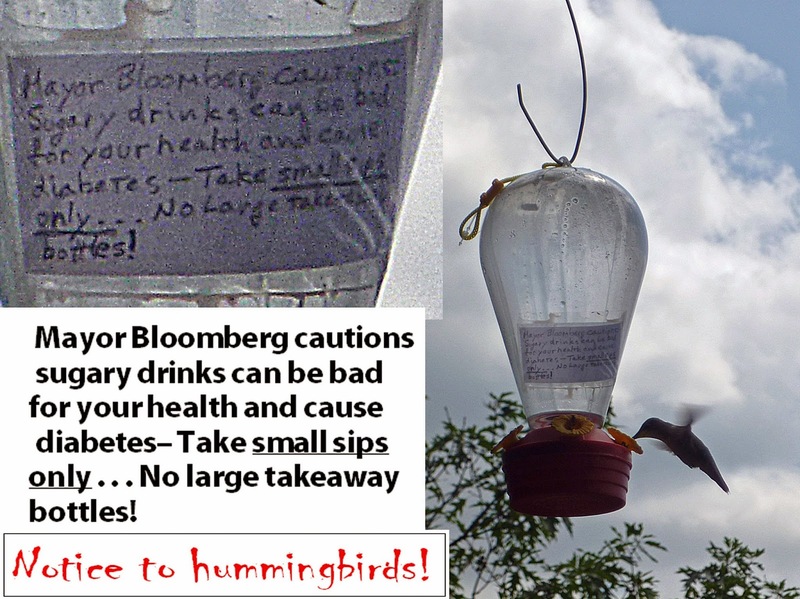 Would it intrigue you to know that this Bloomberg's pushing of sugary drinks relates to the way that New York City Libraries are being sold and shrunk, handed off to developers with an inside track as real estate deals? There is a pretty good story here, but it is surprising how hard it can be to get the media to pick up on some pretty good scoops in this area and disconcerting how selectively the news media is choosing to report certain news. . .
. . The Daily News has a Juan Gonzalez article up today reporting that Queens Library head Thomas Galante is likely to be dismissed from his position Thursday night by a newly reconstituted Queens Library board of trustees. See: Queens Library chief likely to be suspended in upcoming meeting- Close the book on this one. Thomas Galante, the library's $392,000-a-year president and CEO, who has held the post since 2003, will see his fate decided by a new board of trustees on Thursday night, according to board sources, September 10, 2014. You may think that Juan Gonzalez is an investigative reporter who delves into things, one that’s going to give you the whole story, everything you need to know. But do you know what Gonzalez hasn’t bothered to report yet?- What hasn’t been reported at all by the Daily News or the rest of the press as its focuses full bore on this story? . .
. . . It’s not just that these news stories consistently skip over reporting that Galanate’s salary, the main source of contention in the scandal making abject claim on their focus, is lower than the salaries at the NYPL. .
Do you know that the Queens Library had a long history of standing up to Mayor Bloomberg? Did you know that The Queens Library system has been expanding its libraries while the BPL and NYPL have been shrinking and selling libraries to hand off as real estate deals? Did you know that just before Bloomberg left office there was a knock-down, drag-out fight concerning the Queens library board, about what real estate development oriented high-ranking aide the departing Bloomberg would leave as a trustee on the board in violation of the library’s bylaws? . .
. . . That big board fight was immediately prior to the one now playing out. And the last time Albany stepped in to alter a library board via legislation, as was just done here, was to give Bloomberg greater control over the BPL board, clearing the way for those in Bloomberg’s inner circle who were readying to sell and shrink libraries, handing them off as real estate deals. Did you know that the Queens Library has resisted efforts to merge operations of all three library systems resisting so-called "cost-saving": changes that might actually cost the public extra? Read about the way the Queens Library stood up to Bloomberg repeatedly in different ways, starting with the "Snapple" fiasco (the sugary drink connection first mentioned) in Noticing New York: Sunday, August 31, 2014, Mostly In Plain Sight (A Few Conscious Removals Notwithstanding) Minutes Of Brooklyn Public Library Tell Shocking Details Of Strategies To Sell Brooklyn's Public Libraries. You'll get a fuller and more complete understanding of what is likely going on at the Queens Library than just reading Juan Gonzalez's retransmission of the superficial story that several anonymous "board sources" are handing out as if it is, provocatively, the inside, insight-providing story it isn't. That Noticing New York article is chock-full of scoops (highlighted here) about the mismanagement of our libraries, including how library administration officials seem to think that it is just fine and dandy to run libraries as if they were economic development agencies . . . What’s even worse is that they also seem to think that “economic development” means handing off deals to connected developers in crony capitalism fashion.